So it occurs to me that I haven’t yet explained all this long-haul ferry-and-bus voyaging through the Alaskan and Canadian wildernesses. It’s one of those complicated logistical nightmares, but it boils down to a quest for the perfect cheap used car. Hence my trip to Fairbanks. The thing is, Fairbanks has a dry, low-precipitation interior climate, where they do not salt the roads. So old used cars in Fairbanks tend to be dented and ugly, but at least all there — and devoid of interior moss. Also, as mentioned previously, my sister Maggie and her man Shawn run Badger Towing, which is getting famous for its salvage auctions of unclaimed towed vehicles. And they know everybody in town who deals in low-end vehicles. If they don’t have what I need, they can find it. By now you may be starting to notice one flaw in giving a digital camera to an Alaskan male person. Anybody else would take pictures of scenery. But an Alaskan male person will, upon finding a scenic pullout along the highway, pull into it and take a picture of his car. (No matter how crappy.) I’ve actually been doing this forever. Half my photo collection is my old-car-of-the-month in scenic spots. Much of the rest is pictures of my car in not-scenic spots. I suggest you get used to it. The scenery above is the Tanana river and environs, along the Alaska Highway between Fairbanks and Delta. I’m writing this from Eagle, where I grew up and where my father still lives. After equipping me with my majestic new Olds, I got sent over to Eagle by my sister to pry my father out of his cabin after a hard winter and bring him back to Fairbanks for race weekend (of which more later). 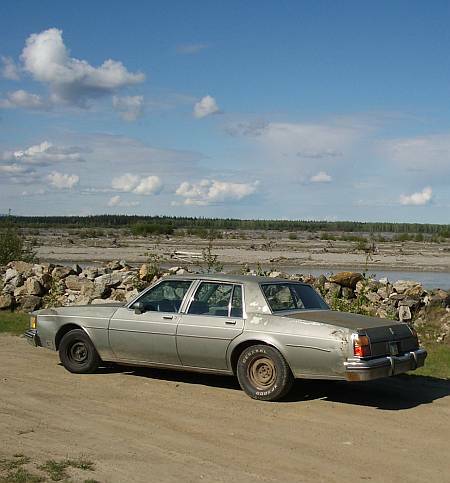 After driving my “new” Olds from Fairbanks to Tok along the Alaska Highway (more than 200 miles) and then over the Taylor Highway (mostly dirt road) to Eagle (162 miles), I’m starting to worry. Why? Because for an old beater, it’s too good. If the engine doesn’t blow soon (and it won’t) I’ll end up wanting to keep it when the summer is over….